Notice how the first column sticks to the left and the heading sticks to the top of the spreadsheet? 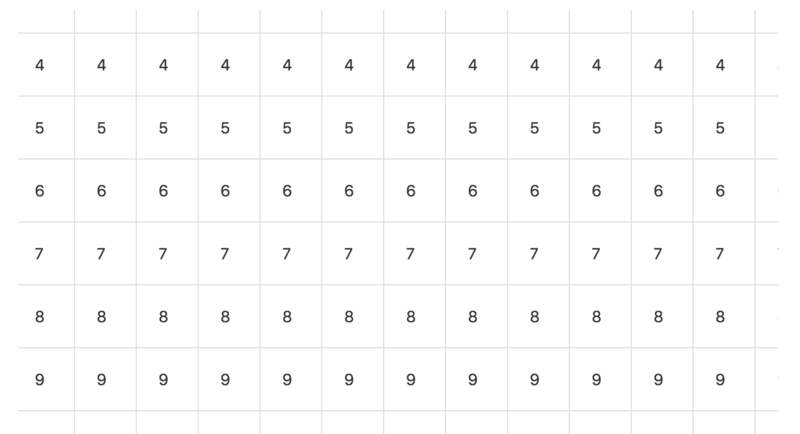 This lets us scan lots of data without having to keep scrolling to figure out which column or row we're in — in a lot of interfaces like this it's pretty easy to get lost. So how did I go about making this thing? Let's jump in! There's nothing really complex going on. We just have a regular ol' table with a <thead> and a <tbody>, but we do wrap the whole table in the table-wrapper div which I'll explain in just a little bit. position: sticky is a wonderfully handy CSS trick that I've started experimenting with a great deal lately. It lets you stick child elements to their parent containers so that as you scroll around the child element is always visible. And this is exactly what we need here for the first column and the heading of our table element. But there we have it! A simple responsive spreadsheet where you can view both the heading and the first column no matter where you are in the table. Although, it's worth noting that your mileage may vary. position: sticky has relatively patchy support right now and so it's worth thoroughly testing before you start using it. Or you could use something like Stickybits that would act as a lightweight polyfill. Also, if you need to dig into tables in more depth then we've made a rather handy Complete Guide to the Table Element. I’ve been using position: absolute; to stick a table column. I’ve been looking for this for so long! I build a lot of event websites and this is perfect for their timetables. Can’t wait to start playing with this! This is cool, but there’s one little tweak people miss: It’s totally valid (and encouraged where appropriate) to use a <th> in <tbody>. It’s good for cells that label the row, such as the first column of your examples. You’ll want to indicate that it should apply to the row, not the column, so add the scope="row" attribute (i.e. <th scope="row">Anna</th>). The nice thing is you’ll be able to re-use a lot of the existing th styling you’ve already got. Oh this is great! Thanks Mark – I had no idea you could do that.